whose compelling story—from embattled but triumphant Jewish girl raised Catholic in postwar Poland to adult spiritual messenger — will introduce you to a healing voice that must be heard in these turbulent times. Part memoir and part historical narrative, The Rose Temple is the inspirational, thought-provoking tale of Lucia Weitzman, who as a toddler during the Holocaust was placed by her parents into the care of a Polish Catholic couple in a desperate attempt to save her. Lucia struggled with—and because of—her dual identity before reconnecting with the Jewish community in early adulthood. She married a Jewish man and raised a traditional family. Years later, after her husband’s death, long-suppressed emotions rose to the surface and she confronted God at Jerusalem’s Western Wall. So began another distinct phase of her life, an unforgettable spiritual journey . . .
At the Wall, during the holiday of Sukkot, Lucia sensed a response to her Divine challenge. She considered brushing the incident aside, but more unexplained experiences followed that seemed to call on her to decipher their messages. At first frightened, she learned to trust her spiritual sensibilities that gave deeper meaning to her experiences while answering larger questions about God’s presence during times of evil and suffering. She began to share with her son, Mitchell, her mysterious writings and dreams, which often contained Biblical images. Mitchell was at first concerned about the reaction he thought his mother would encounter in sharing her experiences with the wider world. But as her resolve strengthened, so did his. Together, they set out to tell her story. 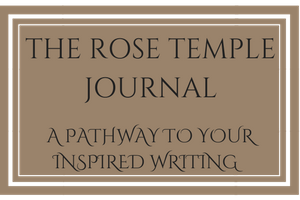 The result is The Rose Temple, a testament to the power of choice that lies within each of us to transform and attempt to heal both ourselves and the troubled world we live in. This dramatic account of the traumatic, but ultimately inspiring story of Lucia Weitzman presents a unique kaleidoscope of spiritual survival and vision quest. Recounted with tenderness by her son Mitchell, Lucia’s life story to date presents to the reader of any religious background a deeply honest attempt to understand the presence of evil and suffering in our world while maintaining a strong sense of relationship with the Divine. The kaleidoscope combines in flashback the evils of Nazi Europe with events of the 21st century, dreams and visions with simple acts of heroism, ordinary human kindness mixed together with inhuman cruelty. Hebrew calligraphy is one of the many sources of insight into overcoming suffering in order to reclaim wholeness that are part of Lucia’s visions. The first letter in the Torah (Hebrew Scriptures) is actually the second letter of the Hebrew alphabet — in the Hebrew orthography this letter (bet) opens to future. Similarly the spiritual lessons of The Rose Temple open to a future where the spiritual paths of many traditions may flow together within a deep and common stream of human spirituality. Lucia’s unique journey can inspire others to transcend suffering and embrace new possibilities for themselves and for our struggling human community.